Arthur and travelling companions 1905. This was the late Victorian and Edwardian era as lived in and observed by Arthur Joseph Dease, a wealthy and well-educated gentleman; some might say a typical product of the English landed gentry and public school system. These letters provide a remarkable insight into a time past ruled by social class and money, an impressive social history. A person could, of course, be wealthy at this period, industrialists and the like, but they would not yet be able to achieve full access into the elite cosy “club” inhabited by Arthur and his family and friends. These letters are not a glossy and romantic retrospective view of the late 19th and early 20th centuries, they give a compelling first-person insight into the time before the First World War. From Arthur's perspective a rather privileged view. For those from Arthur’s background, the Edwardian period was probably remembered as a time of garden parties and gaiety, basking in the wealth created and imported from the British Empire, although of course history sees it in a different light; enormous differences between the those with money and those without. However, the world was changing; in Europe, in particular, the long-established alliances and treaties forged and supported by Royal marriages were under considerable pressure from within as the other dynasties and empires within Europe faced increasing political unrest. The USA was a massive economic threat to the cosy empires of Europe. Time and money were rapidly running out for the elite families of Britain and the rest of Europe. From about 1892 at the age of about 21 Arthur was lucky enough to receive an allowance from his father and used it to travel around the world in search of business opportunities, and judging from his letters, for pleasure too! I am sure these adventures built the strength of character he was later able to invoke at the darkest times of his work during World War One. 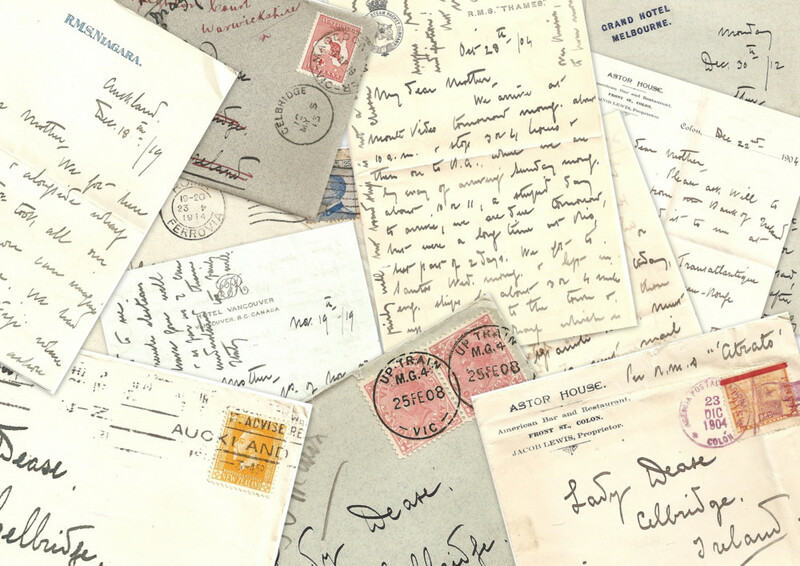 Some of Arthur's Edwardian Letters Home. I am fortunate enough to have over 100 letters he sent home to his father and mother in which he writes a vivid picture of the people and places he encountered. He had many business ideas, and met a great many people around the world from similar backgrounds, probably also looking to make their own way in life. Arthur was also a keen photographer and my research has unearthed an album of photos covering the period from the early to mid 1900's. The album was languishing in an archive in Australia but when you add the contents of this album to the contents of the letters an almost magical transformation takes place. Now when I read these letters I find myself being transported back to a time of discovery and innovation and of course in Arthur's case he could use the advantages of class and money to make the most of the experience. As well as having the letters I have been able to trace Arthur's comings and goings on various passenger lists, in themselves an interesting record offering a glimpse of the differing backgrounds of the passengers on the steamships of the day, and also an aid to identifying Arthur's travelling companions. I have letters from North and South America, Australia and New Zealand, as well as many places he stopped over at in between. I think also we should remind ourselves that this was travel before the days of everyday motoring, and certainly before the advent of passenger flight. Arthur was surely not afraid to visit some out of the way places either, his stance appears to be that life is for living!